Wouldn’t It Be Nice To Get Five-Star Treatment From Your Spa Product Vendor? As you strive to give your clientele a remarkable spa experience, we strive to give you more personalized attention and a higher level of customer service than any other spa product manufacturer. Behind every product we make is Makes Scents Natural Spa Line team of skincare and spa treatment experts with over 60 years of collective experience in the spa industry. We understand what spa guests expect from five-star spas and resorts. We create our products with the guest experience—and your professional reputation—in mind. Our scrubs, body wraps, body butters, and other spa products contain only the finest ingredients formulated to perfection so they deliver top-quality professional results on each and every guest. We create natural, organic, and vegan products—all of which are certified cruelty-free. They feel exquisite not only on the skin, but on the conscience as well. In addition to our signature line, we create custom formulations and private label products to enhance your unique brand and make your clientele’s visits even more unforgettable. When you work with Makes Scents Natural Spa Line, expect to be pampered. Ask any of our spa partners; we go above and beyond to exceed your expectations by paying attention to detail, providing a no-hassle order process, and responding quickly to your every need. Ready to be treated as exceptionally as you treat your guests? Contact us by phone at 717-824-3094 or by email at info@MakesScentsSpaLine.com to learn more about our products and our personalized approach to serving our spa partners. 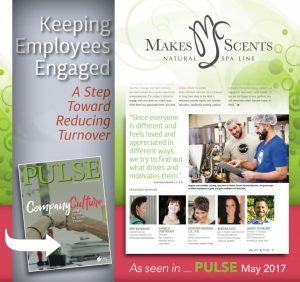 Makes Scents Natural Spa Line is proud to be a member of iSpa®, the organization recognized worldwide as the voice of the spa industry.